Want a better return on a wise flooring investment? provide a effective solution for your hardwood flooring needs. Why work with average, when you can work with an ideal company? You’ll experience optimum personal service, with superlative, effective premium quality workmanship in the industry. Homes are one of the biggest and most important investments and should be cared by an ideal company. We've been in business over 19 years. We are a NWFA flooring contractor and follow industry standards and best practice for hardwood flooring installation, sand and finishing. We have access to training and ongoing professional development. We have well trained staff and we never stop learning. We have a powerful network of talented professionals, distributors, manufactures and experts. We use FSC certified sustainable wood flooring products to ensure responsible forest harvesting to protect the environment. We use low VOC finishes and follow EPA and OSHA laws to ensure a positive impact on health, protect the health of our employees, minimize the risk of accidents and reduce our impact on the environment. 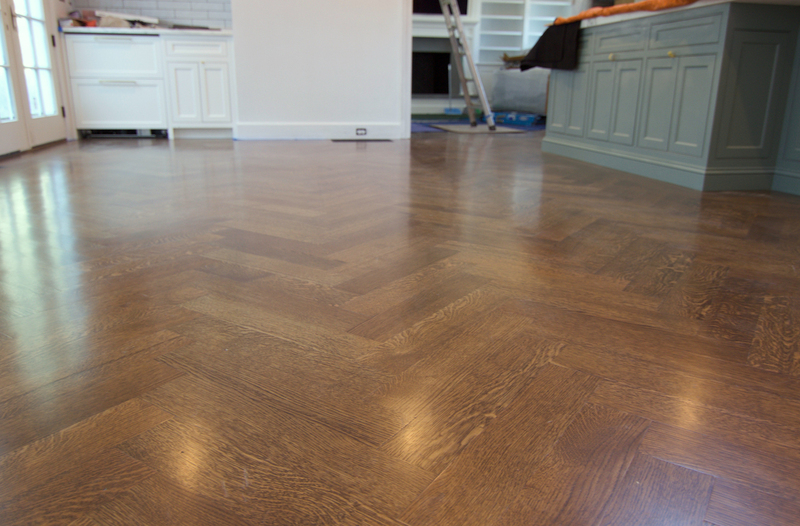 4"x20" rift & quarter sawn white oak herringbone pattern floor. Stained with Bona "jacobean" topcoated with 3 coats of Poloplaz Primero satin polyurethane finish. "Sye came with his crew and work for about three days on the floor. The floor was not leveled they worked from the basement up they leveled the floor as much it was possible . they pulled all the old hardwood they worked on the subfloor and they installed new hardwood. the job went well the floor came out great. Sye is pleasant professional and easy to talk to . His crew was respectful and left everything done and clean. I would use G & S Floor services again and i would reffer them to anybody. The estimate was not the lowest but i decided to go with Sye because i liked the way the estimate detailed the job and Sye seemed to be know a lot about his trade." "Excellent job sanding and putting 3 coats of Poly on. Very professional and great job. Sye was very responsive and great to work with." Best Value - compared to other sources. We use high quality products - are easy to work with - provide results and dedicated to provide our customers with a great experience, quality and long lasting results. Want better returns on a wisely flooring investment? Contact us by filling out the form below.